I'm back today to share a bit of love ;) I made this CAS card using the flag from the Touchdown set from The Alley Way Stamps. I used the 'love' sentiment from the Jibber Jabber set and the 'you' from the get MOOvin' set as well. I am going to put this card in The Paper Players Challenge & the CAS-ual Fridays Challenge also. Lovely!! The dry embossed frame is beautiful!Thanks for sharing with us @ CASual Fridays this week! Gorgeous CAS card! Love that glossy red heart and how it pops against the black and white! Thank you for joining us at The Paper Players! 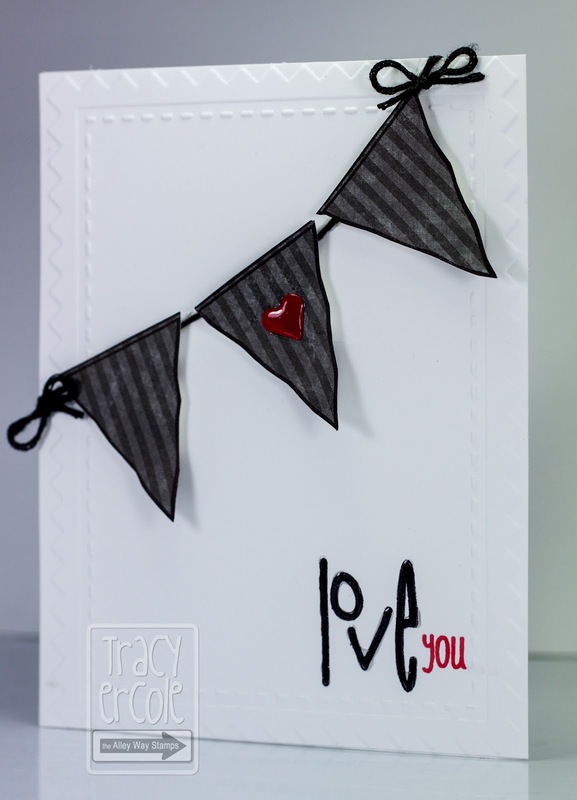 Tracy - I love the embossed frame around this card! The touch of red is awesome too! Thank you so much for playing along with us at CAS-ual Fridays!